Workers on a solar assembly line in Baoding, China. The European Commission has launched an investigation into solar panels and components imported from China, the latest skirmish in a row that could raise tensions between the trading partners. The commission said it was opening the inquiry in response to a complaint from EU ProSun, an industry group that claims Chinese solar products are being unfairly subsidized. The solar industry has long been on the front line of trade complaints against China. EU officials opened a similar line of inquiry in September, and watchdog agencies in the United States have slapped tariffs on Chinese imports in an effort to protect domestic producers. The latest investigation, announced Thursday, will issue its initial findings within nine months, and could result in countervailing duties on Chinese solar products. 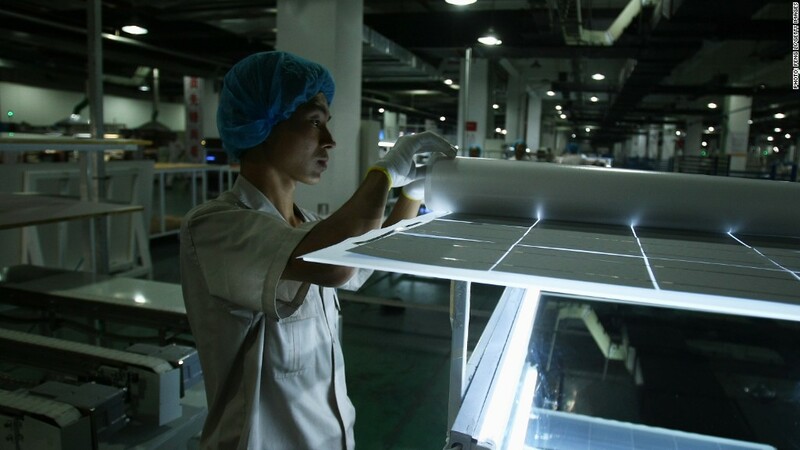 Elevated tension and accusations between China, the EU and the United States over solar manufacturing are nothing new. All three trading partners have sought to encourage growth of their respective solar manufacturing industries. The issue has divided the U.S. solar industry, with some manufacturers complaining that Chinese trade practices are driving prices down artificially and smothering U.S. production. However, solar panel installers have benefited from cheap Chinese imports. U.S. manufacturer Solyndra became the highest-profile victim of plunging panel prices last year, forced to file for bankruptcy despite receiving $535 million in federal loan guarantees. China's solar manufacturers maintain close ties to the state, and have been hammered in recent years as demand for solar panels has lagged far behind supply. Yet they continue to receive favorable treatment from the government in the form of bank loans. China's solar firms have used the loan money to increase production, even as they haemorrhage cash. "Chinese state banks have pumped cheap money into what should be bankrupt companies who have then flooded the EU market with dumped solar products," EU ProSun said in a statement praising the commission's actions. Chinese officials, meanwhile, deny they have unfairly subsidized solar panels. In a retaliatory move, China's Ministry of Commerce launched an investigation earlier this month into alleged EU dumping of polysilicon, a chemical used in solar manufacturing, into China's market. The endgame remains unclear. China's solar producers could, given state support, endure long enough to put their foreign rivals out of business. Or the duties imposed by the U.S., and maybe Europe, could further reduce earnings in China to the point that policymakers roll back their support.